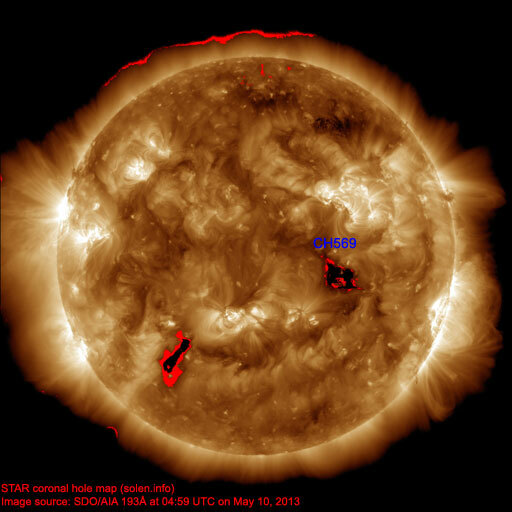 Last major update issued on May 16, 2013 at 04:45 UTC. 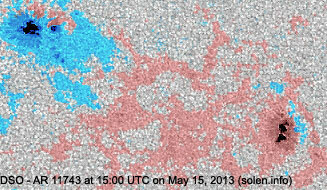 The geomagnetic field was quiet to active on May 15. 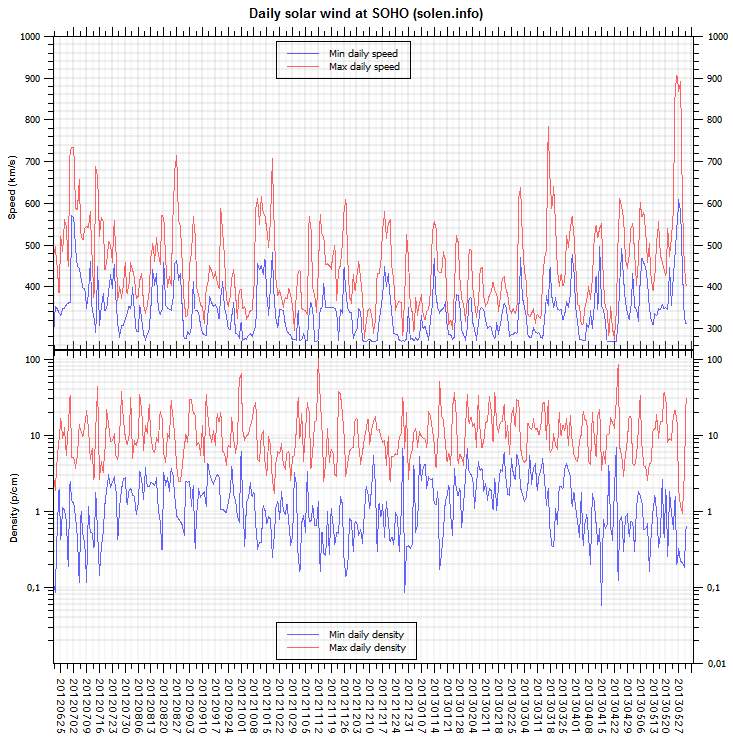 Solar wind speed at SOHO ranged between 331 and 501 km/s. 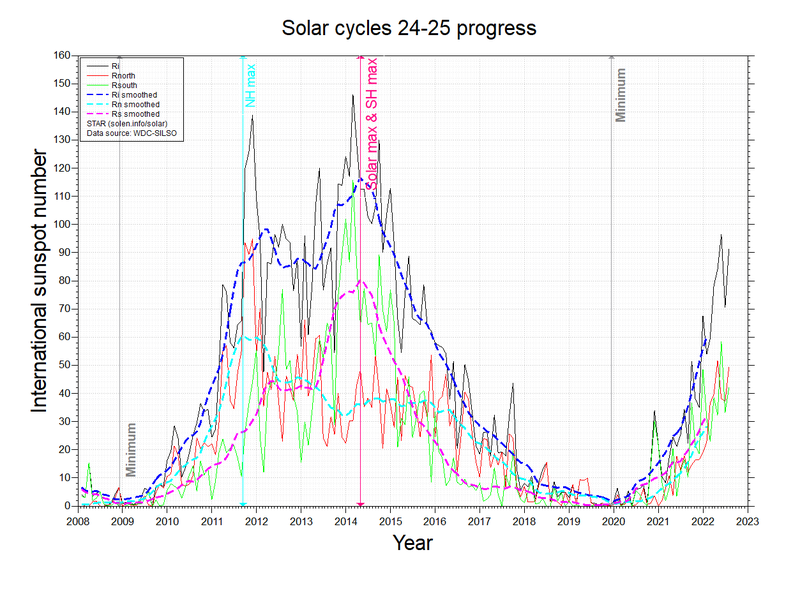 A sudden increase in solar wind speed was observed at SOHO at 07:50 UTC, probably the arrival of a transient associated with a CME. 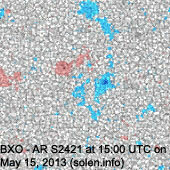 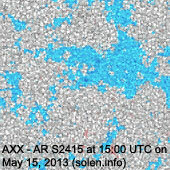 Solar flux measured at 20h UTC on 2.8 GHz was 145.6 (increasing 47.2 over the last solar rotation). 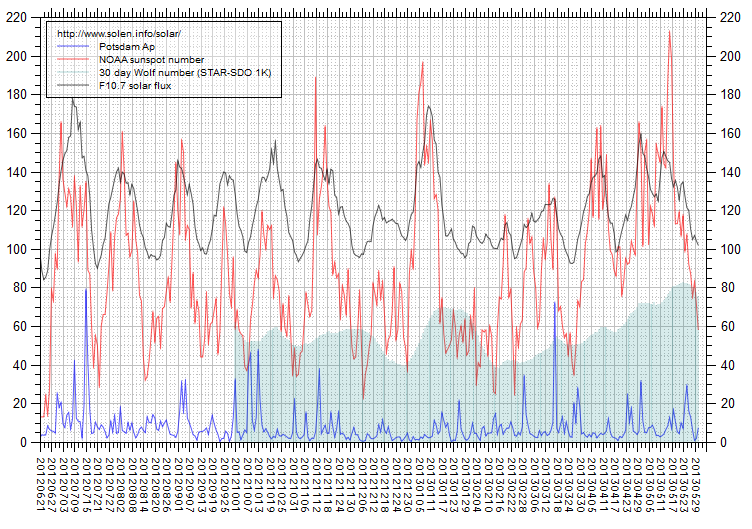 The Potsdam WDC planetary A index was 8 (STAR Ap - based on the mean of three hour interval ap indices: 8.0). 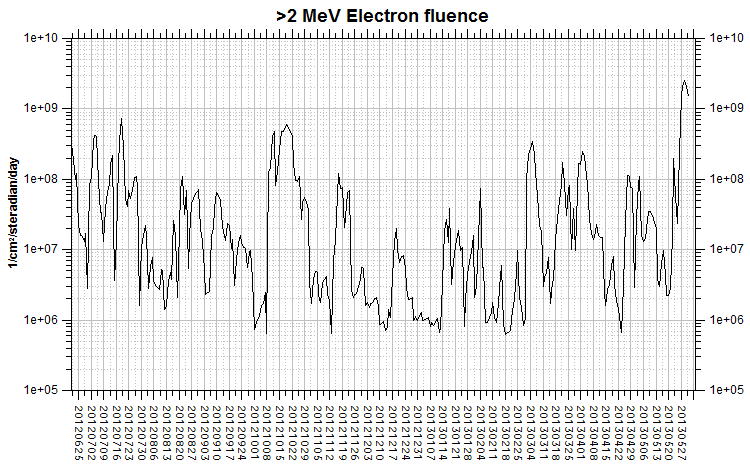 Three hour interval K indices: 11224221 (planetary), 11233322 (Boulder). 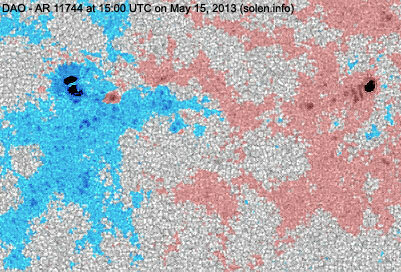 At 15h UTC the visible solar disk had 16 spotted active regions (in 2K resolution SDO images). 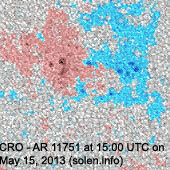 Region 11741 [S21W53] was quiet and stable. 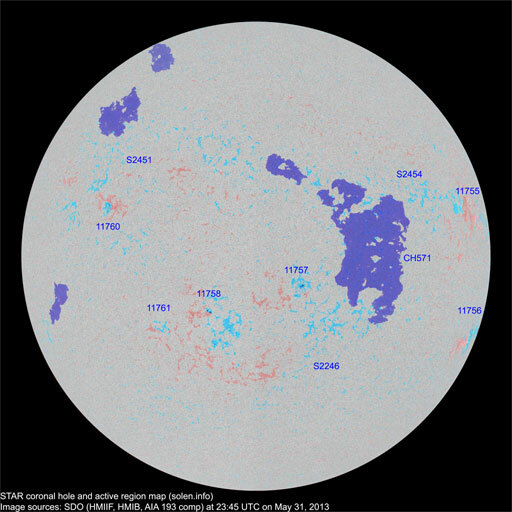 Region 11742 [N30W27] decayed slowly and quietly and could become spotless today. 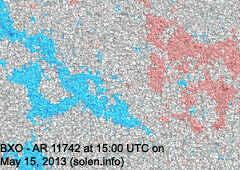 Region 11743 [N21W26] decayed slowly and was quiet. 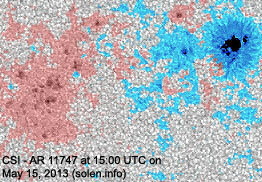 Region 11744 [N04W09] was quiet and stable. 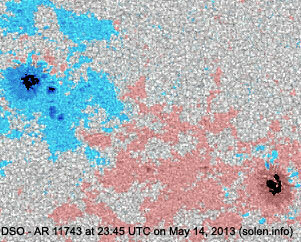 Region 11745 [N12E13] has many penumbra spots in addition to a large penumbral structure. 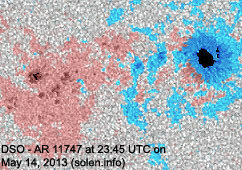 Region 11746 [S28E13] developed slightly and was quiet. 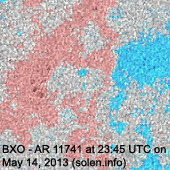 Region 11747 [S18E07] was quiet and stable. 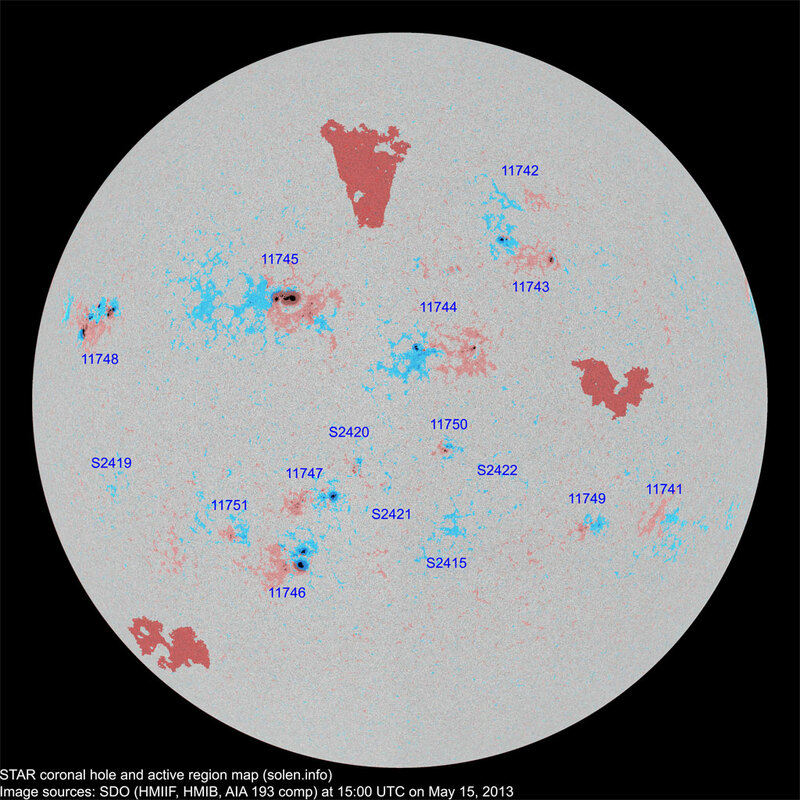 Region 11748 [N11E53] is a compact region which has a magnetic delta structure in the leading spot section. 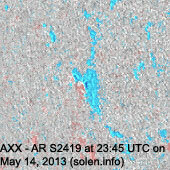 Further M and X class flaring is possible. 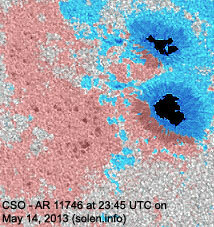 C5+ flares: X1.2/2N long duration event peaking at 01:44 UTC, this event was asociated with an asymmetrical full halo CME. 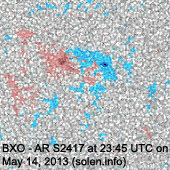 New region 11749 [S23W28] emerged on May 13 and was numbered by SWPC 2 days later. 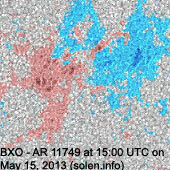 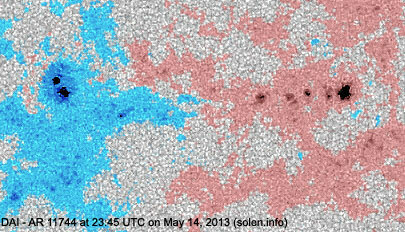 New region 11750 [S11W12] emerged on May 14 and got its NOAA number the following day. 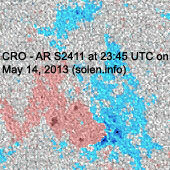 New region 11751 [S24E24] emerged on May 12 and was noticed by SWPC 3 days later. 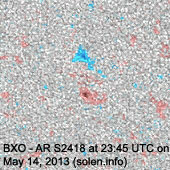 S2415 [S24W13] reemerged with a penumbra spot. 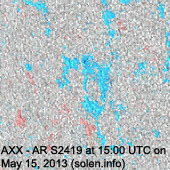 S2419 [S15E50] was quiet and stable. 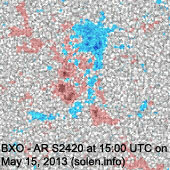 New region S2420 [S13E02] emerged with penumbra spots. 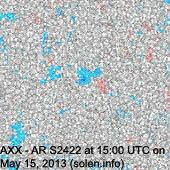 New region S2421 [S17W03] emerged with penumbra spots. 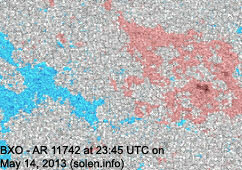 New region S2422 [S17W18] emerged with a penumbra spot. 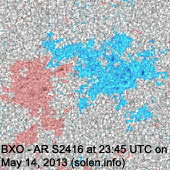 Due to SDO image processing problems at NASA, the following SDO/AIA 4500 image at 23h UTC has been used to display the emergence of new region AR S2423 in the northern hemisphere close to the long axis stretching from AR 11742 to AR 11746. 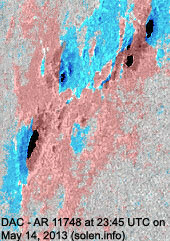 May 13: No obviously Earth directed CMEs were observed in LASCO and STEREO imagery. 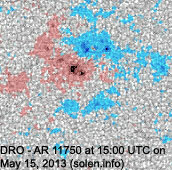 May 14: At least a partial halo CME was observed after the X3 event in AR 11748. 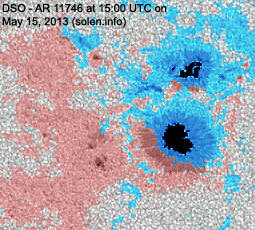 The CME was fast and Earth could see a flanking impact on May 16. 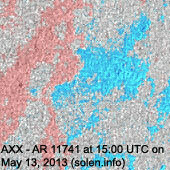 May 15: A wide CME was observed after the X1 event in AR 11748. 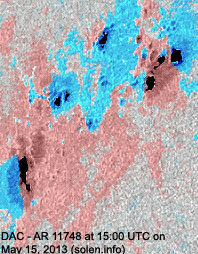 A flanking impact is possible on May 17. 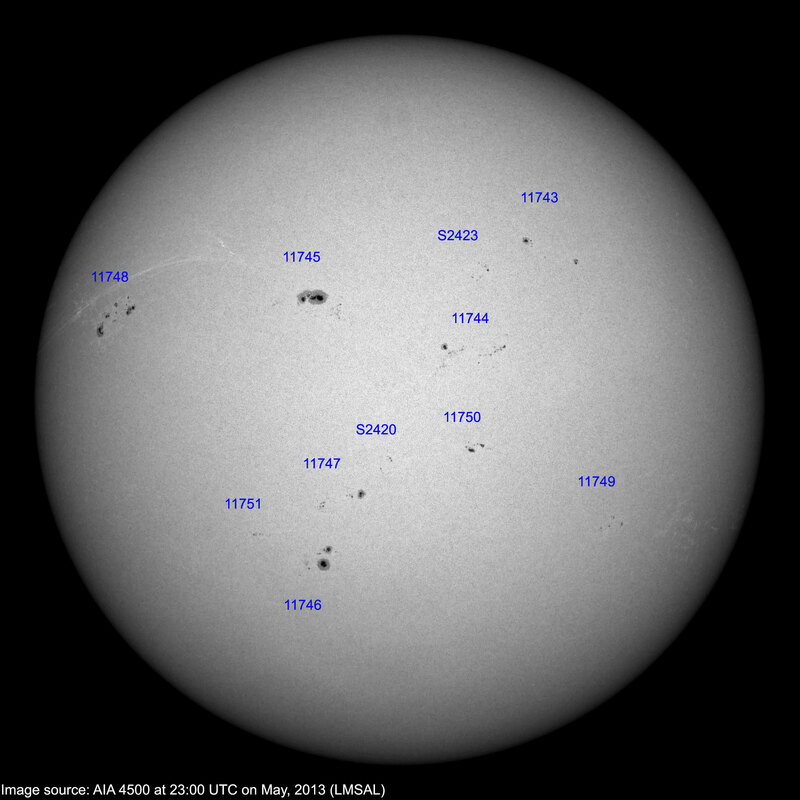 The geomagnetic field is expected to be unsettled to minor storm on May 16-17 due to CME effects and quiet to active on May 18.